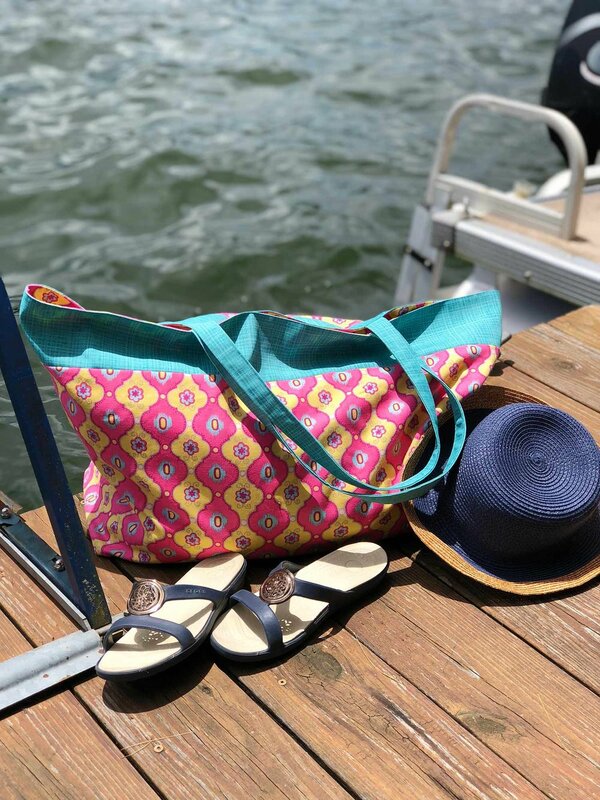 Sew a simple lined tote bag following our detailed photo tutorial. I wanted to make a tote bag for myself that was one-of-a-kind and reflected my personal style for use during travel and everyday outings. 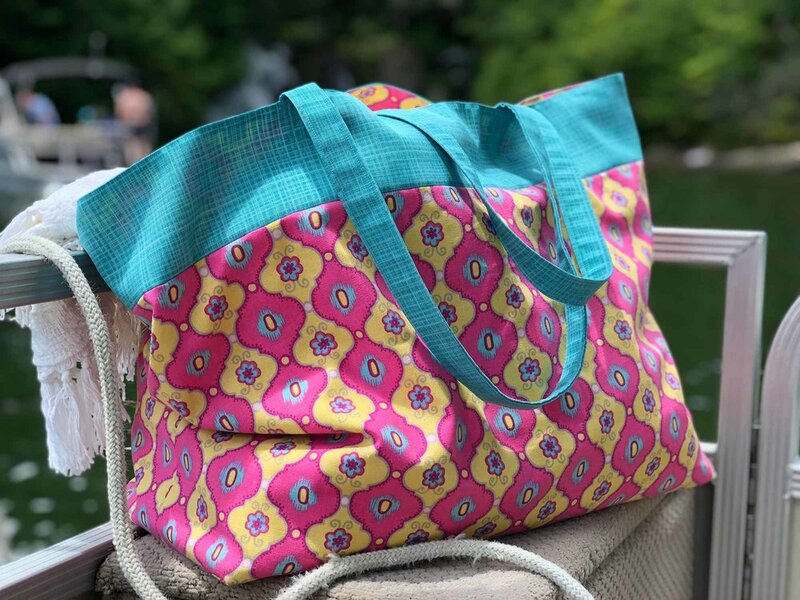 I was inspired by a pattern that featured beautiful coated fabric, but I opted to use readily available duck cotton canvas fabric for the pink and yellow print, and Sunbrella® canvas for the blue trim. Either of those fabric types would work equally well for the entire tote, so my choices were primarily based on which prints and colors I liked! While I sewed I came up with a few tips and modifications which I've shared in my photo tutorial below. *Note: I used the same fabric for both the outside main body and the inside lining; if you wish to do the same, purchase 1 1/4 yards of main body fabric and omit the lining yardage shown above. This is the darling free Green Market Tote pattern from KD Spain's free pattern page that inspired me to make my own version. Note: Some fabric prints are directional, so be sure to note the direction of each of your pieces as you cut; I used a sticky-note pinned to each piece. Note: 1/4" seam allowance used throughout project unless otherwise noted. With wrong sides together, fold each strap in half lengthwise; press. Fold long raw edges to inside, butting the raw edges against the inside center fold; press. With right sides together, sew a top band to the top of each main body rectangle to make outer body; press seams open. With right sides of outer body together, sew sides and bottom seams. 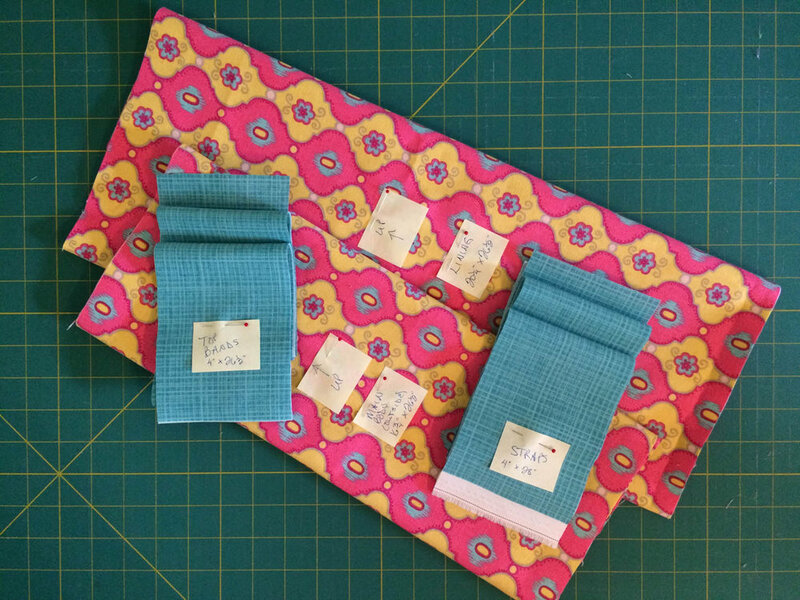 I used a quilting ruler with a 45º line to help mark my sewing line for boxing the corners. Mark, sew, and trim corners. Turn outer body wrong side out. Note: I left a side seam of the lining open for turning instead of ripping a seam. 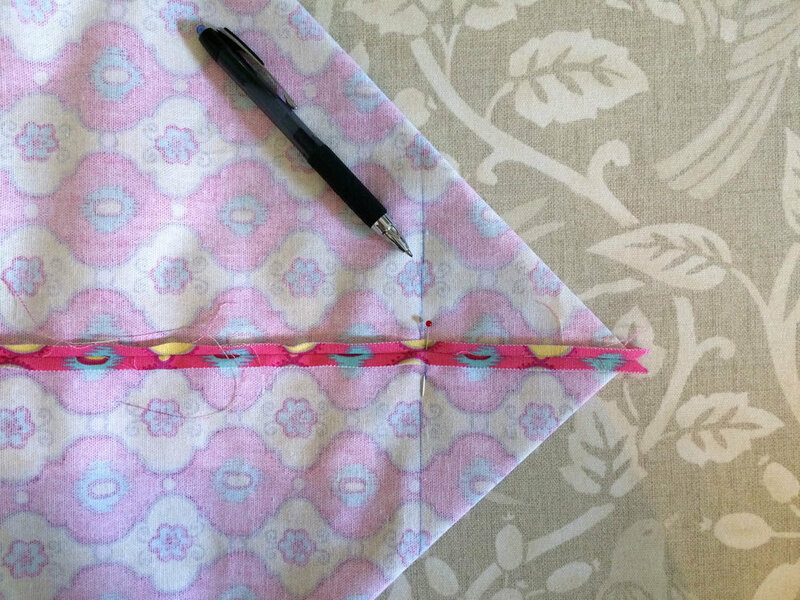 Before you sew, be sure to note which way is "up" if your lining fabric is directional. To mark the strap location, along top edge of one lining rectangle, measure and mark 8" and 9" from right raw edge; repeat measurements and markings from left raw edge. Duplicate the same measurements along the top edge of the second lining rectangle. To leave an opening for turning in the lining, mark 8" down from the top of lining along one side edge, and again at 14" from the top of the lining. Sew sides and bottom of lining, leaving open on one side where marked for turning. Make box corners the same as for outer body. Turn lining right side out. Mark 1 1/2" from each end of straps. Pin straps to top edge of right side of lining at markings, being careful not to twist, leaving 1 1/2" of each strap-end extending beyond the upper raw edge, and being careful not to twist the handle. Insert the lining into the outer body, being certain that right sides are together; pin, matching side seams of outer body and lining. The straps will be nestled between your lining and outer bag at this step. Sew around entire upper edge of tote, slowing down a bit when sewing over the straps, and backstitching over each strap. Turn the tote right-side-out by gently pulling the entire tote through the side opening that was left in the lining. Hand or machine-sew the lining opening closed; I folded the raw edges of the lining opening to the inside and machine stitched close to the folded edges. Press the upper edge of the tote carefully, slightly turning the lining to the inside. On the outside of the tote, top-stitch 1/8" from the upper edge. To reinforce each handle, I used a 1" square as a guide and marked a dot at each corner of the guide and sewed from dot to dot. Tip: you may choose to use plastic canvas instead of cardboard for washability. With right sides facing, sew the cardboard base covers on three sides, backstitching at beginning and end of sewing, and leaving one short end open. Turn right side out. Insert the cardboard, trimming it to fit if necessary. Fold the top edges to the inside. I used a fabric glue stick to hold the opening together, which might come in handy in case I need to replace the cardboard sometime later. Insert the cardboard base into your finished tote, gently fitting it into your boxed corners. I pressed the outside of my tote along the edges of the cardboard base to help the tote hold its shape. To keep your tote looking fresh and clean longer, consider spraying the outside of your tote with Scotchguard Fabric and Upholstery Fabric Protector, following the manufacturers instructions. You might also enjoy my other DIY & Crafts posts, including my tutorial on how to make Simple Scrap Pin Cushions in A Few Easy Steps and a DIY Ribbon Clipboard by up-cycling and old frame. We participate in the Amazon Services LLC Associates Program, an affiliate advertising program designed to provide a means for us to earn fees by linking to Amazon.com and affiliated sites. Yarn Scissors Silk has provided our honest opinion regarding this product; any fee earned does not affect your price but helps to support our site, and we thank you! Silk fabric (from the remnant section!) + a little ribbon trim = 1-of-a-kind DIY scarf.